To install a child-restraint system, if the seat is equipped with a head restraint, remove it. Always follow the instruction manual accompanying the child-restraint system. Always remove the head restraint and install child-restraint system: Installing a child-restraint system without removing the head restraint is dangerous. The child-restraint system cannot be installed correctly which may result in death or injury to the child in a collision. Always install the head restraint and adjust it to the appropriate position after removing the child-restraint system: Driving with the head restraint removed is dangerous as impact to the occupant's head cannot be prevented during emergency braking or in a collision, which could result in a serious accident, injury or death. When installing a child-restraint system, follow the installation instructions included with the product. In addition, if the seat is equipped with a head restraint, remove it. Follow the manufacturer's instructions for the use of the child-restraint system: An unsecured child-restraint system is dangerous. In a sudden stop or a collision it could move causing serious injury or death to the child or other occupants. Make sure any childrestraint system is properly secured in place according to the manufacturer's instructions. Make sure the child-restraint system is properly secured: A child-restraint system that is not secured is dangerous. In a sudden stop or collision, it can become a projectile and hit someone, causing serious injury. When not in use, remove it from the vehicle, put it in the luggage compartment or at least make sure it is securely fastened to the ISOFIX anchors. Make sure there are no seat belts or foreign objects near or around the ISOFIX anchor-secured child-restraint system: Not following the child-restraint system manufacturer's instructions when installing the child-restraint system is dangerous. 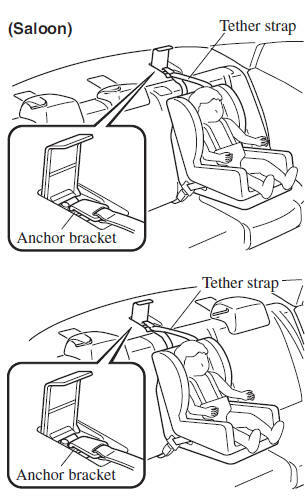 If seat belts or a foreign object prevent the child-restraint system from being securely attached to the ISOFIX anchors and the childrestraint system is installed improperly, the child-restraint system could move in a sudden stop or collision causing serious injury or death to the child or other occupants. When installing the child-restraint system, make sure there are no seat belts or foreign objects near or around the ISOFIX anchors. Always follow the child-restraint system manufacturer's instructions. First, adjust the front seat to allow clearance between the child-restraint system and the front seat (page 2-5 ). 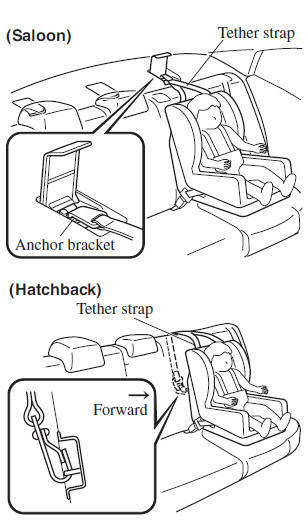 Make sure the seatback is securely latched by pushing it back until it is fully locked. Expand the open seams on the rear of the seat bottom slightly to verify the locations of the ISOFIX anchor. 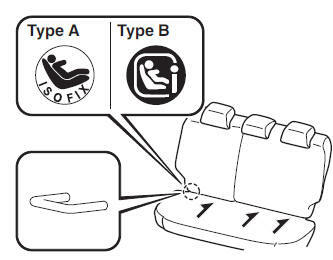 The markings above the ISOFIX anchors indicate the locations of the ISOFIX anchors for the attachment of a child-restraint system. If the seat is equipped with a head restraint, remove it. 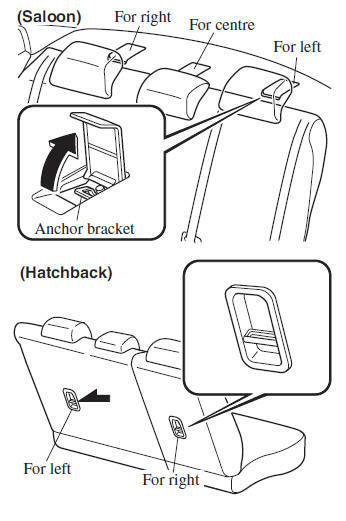 Secure the child-restraint system using the ISOFIX anchor, following the child-restraint system manufacturer's instruction. If your child-restraint system came equipped with a tether, that probably means it is very important to properly secure the tether for child safety. 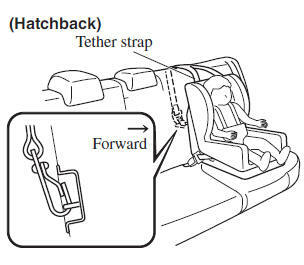 Please carefully follow the child-restraint system manufacturer's instructions when installing tethers (page 2-35 ).